The dust is still settling after the results of this year’s historic election, and Americans are trying to imagine what the country will look like when president-elect Donald Trump takes office. With Republicans having control in both the Congress and Senate, Trump will have an unprecedented level of power to enact change on the country, and that power could mean serious changes concerning America’s retirement system, especially Social Security. No matter how far away from retirement you are, it’s imperative for you to understand what Trump and Federal legislators could have planned for Social Security, and what you should do about it. Throughout the campaign, Trump’s plan to give out massive tax cuts while simultaneously boosting military, infrastructure, and energy spending left many worried that he might cut programs like Medicare, Medicaid, and Social Security to make up the difference. Trump reassured Americans that he wouldn’t consider such cuts to fund his plan, but in his book, The America We Deserve, he labels Social Security as a “ponzi scheme” and claims it should be privatized. And even if he’s changed his mind since then, strong party pressure could encourage him to break that promise. [Paul] Ryan and other House Republicans have been trying for years to cap the government’s share of Medicare, a step that would lead to huge jumps in premiums for seniors, and to limit Social Security benefits by raising the retirement age, change the cost of living index, or other adjustments. In the campaign, Trump said he’d oppose those changes. But I would not be surprised if he accepted changes that Congress brought to him. Here’s the thing: in its current state, Social Security is indeed a broken system that could face serious shortfalls in the not-too-distant future. The real question is whether Trump will rip off the Band-aid now at the expense of current and near-term beneficiaries, or keep propping up the system to avoid making waves. 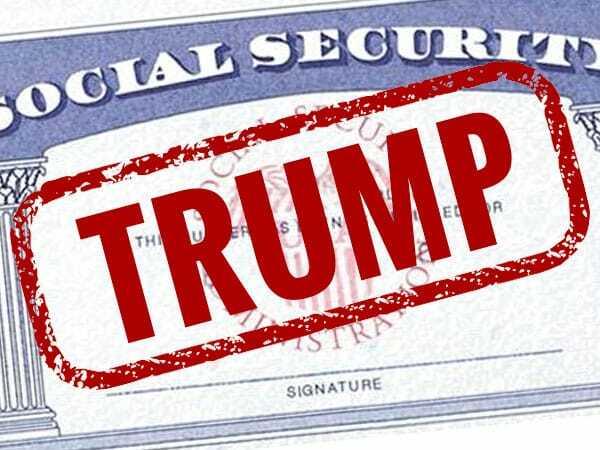 Just remember, if Trump does decide to bite the bullet and reign in Social Security — or even work toward phasing it out altogether — it wouldn’t be all bad news. The result could mean a huge reduction in income taxes for current workers, which in turn would bring further economic stimulation and a stronger middle class. It would be a severely bitter pill to swallow, but suffering today to create a stronger, healthier economy tomorrow might be exactly what we have to do. We don’t know what Trump will do when he gets into office or even how markets will respond over the next four years. As a result, Americans are starting to wonder how and when they should change their savings and strategies for retirement. Thankfully, the answer is relatively simple. Through a long-term lens, history shows that a single president is unlikely to have a catastrophic impact on the market, so you shouldn’t do anything drastic. What you should do, however, is hedge your savings using a physical asset like gold. Physical assets hold tangible value that never goes away, unlike stocks, bonds, and traditional investments. Plus, they have an inverse relationship to the market, meaning when the market goes down, they tend to go up. Regardless of age, anyone concerned about what America’s retirement climate will look like in the future should consider using gold to protect their wealth and financial security.